The OHRU has a substantial collection of oral histories relating to defence electronics which are being transcribed and catalogued. Click here to visit a presentation on the history of radar created by the Talking about Technology project, which contains extracts from interviews with those who worked at TRE during WWII. With these accounts, it is our aim to record how the development of these technologies came about from the point of view of those directly involved in their conception. 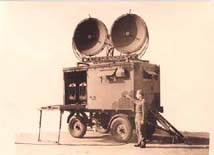 The Wireless Set No.10 was the first radio unit to offer multi-channel communication, and came into service after the D-Day landings of June 1944. By providing a mobile and secure form of contact between battlefield commanders and their operational headquarters the WS10 was an essential contributor to the successful advance of the Allies across Northern Europe . Click on the image to enter this area and learn more. (This presentation has been created by James Cambrook in fulfilment of coursework requirements for Level I, BSc History, Philosophy and Social Studies of Science, University College London). It cant work...But it did! This site was created by Peter Davis in 2000 as part of his Personal Research Project for BSc Heritage Conservation. Click here to take a short journey through some of the exhibits at HMS Collingwood Museum. Can you contribute to this archive? Click here to send us your memories.